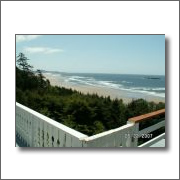 Sitting atop a bluff amongst the scented pines of Otter Rock Alpine Chalets offers luxurious family resort style lodging situated halfway between the attractions of Newport and Depoe Bay. It is truly a place to get away from it all, and don't forget all the little ones as they are also pet friendly! Whether you're planning a weekend getaway or an extended vacation, the magnificent Central Oregon Coast awaits you. Awe inspiring panoramic views of the Pacific coast, long secluded walks along beaches and headlands, wildlife and whale watching, art galleries, restaurants and speciality shops you'll find plenty of reasons to linger a while on the beautiful and pristine Oregon coast. Plan your visit to Newport. take a short video tour of the central Oregon Coast around Newport. A guide to the lighthouses of the Oregon Coast.